I finally got my Official Field Test Shooting Review for the ASG Ruger MK 1 Gas 6mm Airsoft Pistol, make sure to also check out my Table Top Review for this Airsoft Pistol for more information on features, specifications and high quality photos taken by yours truly! 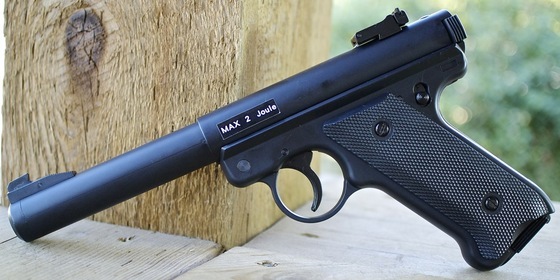 In this Field Test Shooting Reviews I test out the ASG Ruger MK 1 Gas Airsoft Pistol and put five rounds through my Chronograph to find out what the average fps is using .20 gram BB's and propane gas. ASG claims a pretty conservative 328 fps, I was expecting much higher and got much higher even on this rather mild fall BC day. I shoot the ASG Ruger MK 1 Gas 6mm Airsoft Pistol from the 20 foot range since I hadn't done a pre-test of any sort. While shooting from a semi rested position at 20 feet back, I was able to get a 2.5 inch 10 shot group that kind of separated its self into two sub groups, one nicely centered right in the bulls eye and then another group of four that drifted a bit high and to the right a bit. The trigger pull on the ASG Ruger MK 1 Gas 6mm Airsoft Pistol is double action only and kind of on the long side but it is very smooth and has a nice satisfying metallic click to it, I found it pretty easy to shoot. If you are a Ruger 22LR shooter than you may just want to get your hands on one of these and have the freedom of being able to shoot it just about anywhere!